This is another new Sinn watch that will make a lot of people very happy. Sinn has produced a number of dive watches with blue dials, the most notable of which are the now retired Sinn U1000 B and the T Series titanium watches (T1 and T2) with blue dials. 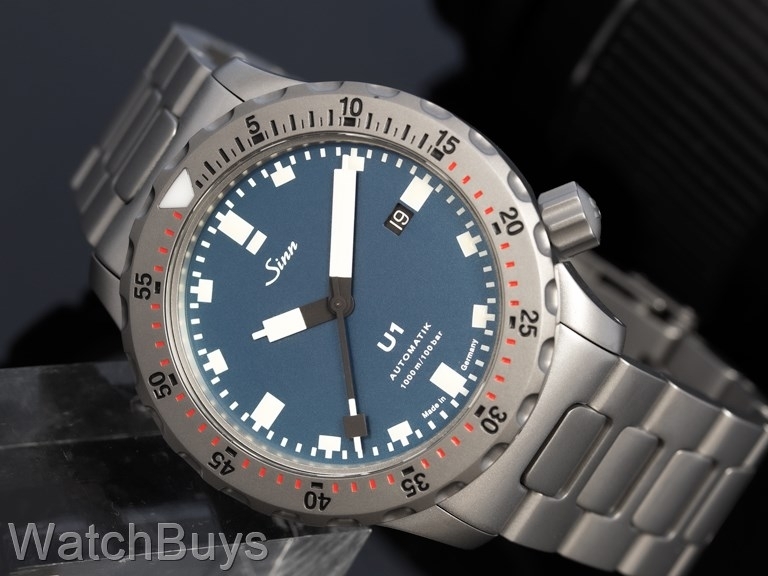 But by far the most requested Sinn divers watch with a blue dial is the Sinn U1 (and yes we have been asking for such a watch for many years), so we are very pleased to now announce the release of the new Sinn U1 B. The Sinn U1 B case is made from the same steel that is also used in the construction of the outer hull of German submarines. The steel is procured by Sinn from a steel supplier to Emden GmbH, one of Germany's North Sea shipbuilding yards who construct submarines from the very same steel. Because of this special submarine steel, the case resists the effects of exposure to salt water and salt water environments and the related impacts of corrosion. The international testing lab of Germanischen Lloyd has tested the Sinn U1 B, and determined that the watch can be certified as water resistant to 1,000 meters. This same firm tests submarines for their ability to withstand the effects of underwater use. This watch is fitted with a Sinn H link bracelet with locking clasp. Verified Owner Comments: This is absolutely one of the best purchases I've made.Quality is top notch. Excellent service from Watchbuys, they went above and beyond to ensure I had a very positive buying experience. Verified Owner Comments: I have owned the U1 in the past and loved the piece. It is a both a soliid 'tool' diver watch but moreover it is a real beauty on the wrist. When i saw this new blue model I was hooked. Once I had this one it looked even better in person. If you loved the original U1 then you will find this one even more beautiful.